I admit that one of my favorite Newton sets is the Newton Dreams of Paris stamp set! 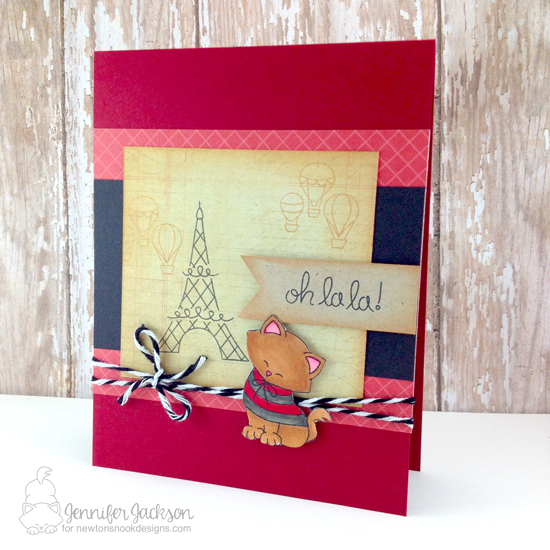 Today I'm sharing two cute cards I created with this set! For this card I stamped the eiffel Tower and some hot air balloons on a paper that had a subtle notepad pattern on it. I inked the edges with distress ink and added it to my red card base with some some black cardstock and a red geometric patterned cardstock. I colored the kitty with copics, giving him a red and black striped shirt and added him to the foreground of the card. I fussy cut him out for this card but if you don't like fussy cutting this set does have a coordinating die available: Newton Dreams of Paris Die Set. I also added the "oh la la" sentiment on a piece of kraft cardstock that I cut into a banner and inked the edges. For my second card us used the image of the kitty in his sweet little beret! I stamped the kitty and the "bonjour" sentiment onto watercolor paper and colored him using inktense watercolor pencils and water. 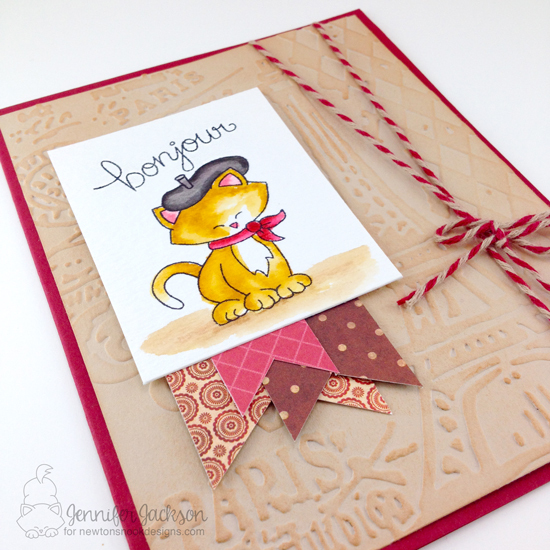 Then I used a Paris Themed embossing folder to create the fun background, inking slightly over the embossed parts to make them pop a bit more! I then added the kitty image onto the card along with some little flags using red pattern paper scraps and, of course, some bakers twine! Hope you enjoyed these Paris cards today! If you like this set, you can find more fun cards using it on our Newton Dreams of Paris Pinterest board too! Super cute cards! I just bought those stamps and dies, can't wait to use them! super adorable cards :) love them! How sweet and cute! Love the soft colors and Paris feeling in these cards! Gorgeous, I also get the Paris vibe on these..and oh that striped sweater, too cute!